The Coosawattee River Resort is home to wonderful and varied amenities. Throughout the property you will find different amenities easily accessible from wherever you start. The amenities range from indoor and outdoor swimming pools, camp sites, river parks, tubing (during the summer season), weight room, game rooms, miniature golf, horse shoe pits, tennis courts and basketball courts. There is also a covered pavilion at the Rec Center play area which can be reserved for birthday parties. The resort also is home to the Water Tower Conference Center. This facility, located on one of the highest peaks inside the property has some of the most breath-taking views available in the community. The Water Tower is used for a variety of functions and events, ranging from weddings, receptions, parties, showers, seminars as well as used for club and board meetings. The Rec Center is the jewel of the Coosawattee River Resort's Amenities crown. We have just recently completed an extensive renovation of the pool area as well as several major improvements inside. The pool itself is 40 X 75 ft. it is 8 feet at the deep end with a large shallow end for the small ones. 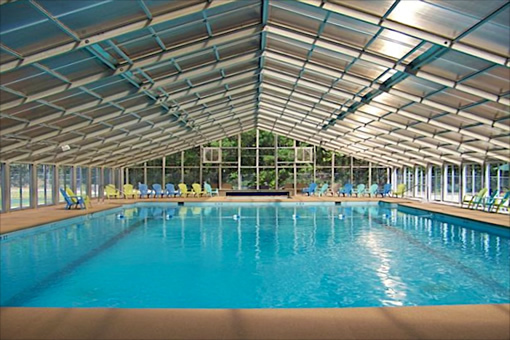 The pool is heated and enclosed so you can swim comfortably year round. Each and every Monday, Wednesday and Friday there are water aerobics classes held in the morning. Since installing a new state-of-the-art chlorination system, the pool no longer has to have chlorine added. The game room is a coin operated arcade with games, pool tables, ping pong table and an air hockey machine. The weight room is complete with treadmills, a TV to watch your favorite show while walking or, you can bring a video to exercise to. There are weight machines, free weights, a rowing machine and exercise bikes. The Teen Center is a beautiful outdoor pool. The pool is three to five feet deep throughout. While it carries the name of "Teen Center", don't be fooled; it really is more family oriented with kids from one to one hundred enjoying the sun and fun. Small children can enjoy the pool since it is only five feet deep, but everyone can have a wonderful time. There is also a kiddy pool for the toddlers and babies. The Teen Center also has picnic tables and camping at Indian Fish Trap Park is only a short walk across the Coosawattee River over the swinging suspension bridge. The Water Tower Conference Center was originally designed as a fine dining restaurant. While it is no longer a dining establishment, the Water Tower is used for a variety of purposes. With a beautiful, breath-taking view from its dining area, the Water Tower is a favorite for weddings, receptions, showers, parties, reunions and gatherings for ten to one hundred.